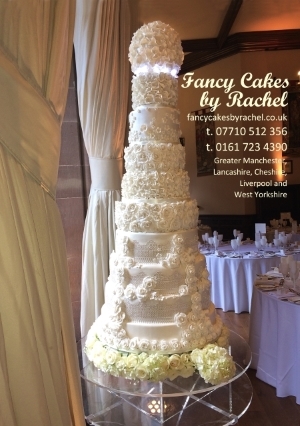 With 16 years of baking experience, Fancy Cakes by Rachel specialises in bespoke Wedding cakes and celebration cakes. To see the full range of our cakes please look in the Galleries. Tiered wedding cakes can be all the same flavour or each tier a different flavour. You can choose. Have a look at the cake flavours page to see some of our more popular cake flavours. If you would like a really tall cake display but don't need so much cake we can make some of the tiers dummy cakes, so it looks as if it is all cake.